By Roger Thompson, an excerpt from No Word for Wilderness In over a thousand years of recorded history, no record exists of an Apennine brown bear attacking a human. A millennium of peaceful cohabitation. In the lore of large animal and human coexistence, there is no comparable record of side-by-side living. The Abruzzo bear is unlike any other bear out there. While Bruno; his mother, Jurka; Daniza; and their Slovenian ancestors and siblings romp through northern Italy with sometimes violent abandon, Abruzzo bears breeze through forests like friendly ghosts or harmless hermits. 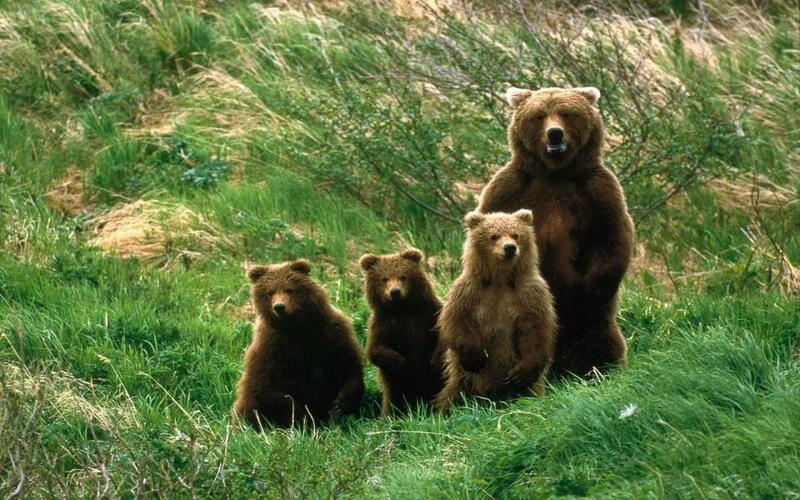 Most locals love the Abruzzo bear, sometimes calling him “father bear” in doting, lilting Italian. While a healthy skepticism and sometimes fear of the bear remains in the mountains of Abruzzo, most know the bear to be peaceful, reclusive, and downright friendly. They have formed a relationship with the bear that other parts of the world would hardly believe. 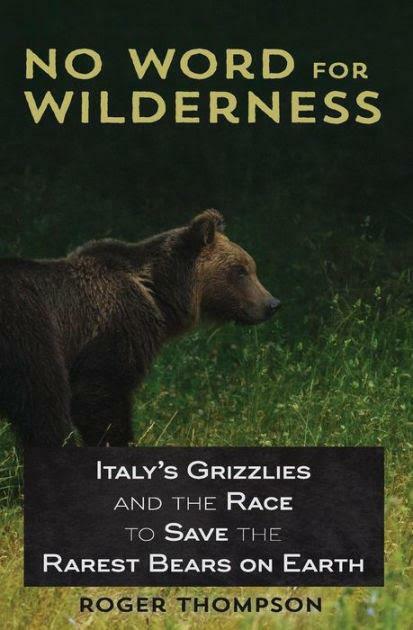 Indeed, the relationship between the so-called Italian grizzly and the Abruzzese is a modern Pax Romana and a model of cohabitation, if not symbiosis. Bear and human have not only found a way to live together but to share resources. How that relationship developed has been lost to history, but traces of it remain in local stories and in the land itself, where human activity has left records that can be seen from the roads crisscrossing the region. Across Abruzzo, mountaintops are barren of trees. While in some cases, the open alpine landscape is the result of elevation, many other cases are, in fact, man-made, alpine-like creations. They are stunningly beautiful, even if they are artificial. From the valleys, they appear to be great fields of green that roll over the tops of the mountains. Deer graze in them, and wild boar scurry across the open expanses, stopping occasionally to root around and tear up the vegetation, exposing black earth and white limestone. From the mountaintops and barren ridges themselves, the views stretch on a clear day for a hundred miles up and down the Apennines, with the Adriatic visible to the east from some of the peaks. The open expanses provide some of the most accessible and scenic hikes in Europe, and it seems for all the world that it is true alpine habitat. It is not. While some of the mountains in the region climb above 9,000 feet and have the signature barren look of the Italian Alps to the north, most of the open land in Abruzzo National Park comprises man-made pastures. Cleared generations ago for sheep, the land has been grazed for so long that much of it has essentially transformed into a false alpine region, complete with some of the same flora and fauna that exist in higher elevations. While great forests thrive across the region, stretches of barren land wind through and above them, testaments to human need and consumption. Precisely when and how the area became home to sheep herding is subject to speculation among local storytellers. The tales are a local pastime, but what is clear is that shepherds had no illusions about the wildness of their region and the costs of doing business in it. Families throughout the region report that previous generations spoke openly about sharing the land with the bear. And the bear, apparently, learned to share the land with the shepherds as well. Among some of the Abruzzese, the notion of the “nature tax” emerged, and local families still mention the term with a kind of wistful nostalgia. The idea was that one had to pay nature for the privilege of working the land. Of course, one only pays taxes up the hierarchal chain to those who have dominion over the land, and in this case, the king of the natural world was unequivocally the brown bear. At some point in the history of sheep herding, shepherds decided to work with, instead of against, the bear. Instead of constantly worrying about whether the bear would take a sheep, they included a couple extra sheep in the herd with the knowledge that at some point, the bear (or perhaps the wolves) would need to be paid. This tax, however, extended beyond payment with lambs or sheep. Some locals would plant an extra apple tree a bit farther away from the rest, or would set up an extra beehive in the apiary, knowing full well that occasionally a bear would come and have a hankering for some sweet treats. The bears, apparently, rather agreed with this arrangement. No one can recall an encounter with an aggressive bear, and the official storyline, borne out by the complete lack of mention of bear attacks in standard historical documents, is that the bears have never mauled a human. Certainly, there have been no fatal encounters. One park official, speaking on condition of anonymity, admitted that at least one person had been injured by a bear, but that person had shot the bear, failed to kill it, and approached the animal to finish the job. The bear, not keen on being slain by hand, fought back. “The guy deserved it,” the park official said, and few would likely consider such an encounter a “bear attack.” Of course, this is not to say that shepherds were not aggravated by the bears. Some certainly must have been, and some must certainly have feared stumbling into one in the high meadows. Still, they had taken other precautions to ensure they and their flocks were safe and that their homesteads were not ravaged by hungry bears. Livestock pens provided a measure of deterrence, especially for shy bears, but the presence of cane da Pastore Maremmano Abruzzese, a sheepdog native to Abruzzo, provided the best protection from bears. Maremma Sheepdogs are notoriously independent and rugged yet remarkably gentle. They are large and look like an albino Newfoundland or a pure-white Pyrenean Mountain Dog. Able to make long traverses with their herds, today they freely romp across the valleys and mountain tops of Abruzzo, apparently free of their guard duties. They are by reputation fearless and willful, devoted to their owners and, above all else, their herds. This native dog stands as the great guardian of the region, and his distinctive role in shaping the cultural history of the area should be seen as just as important as the role of the bears in shaping the identity of the region. They are ubiquitous, they are unmistakable, and they are, after a good wash of their thick coat, perfectly charming. Italians, betraying their ongoing pride in regional history, insist that Maremma raised in one valley are distinct from those in the neighboring valley or from the neighboring hilltop town. Each little corner of Abruzzo, locals insist, has its own breed of Maremma, perfectly adapted to that spot in the mountains. The breed purportedly extends back to Roman times and has been a crucial part of the Pax Romana between animal and human in central Italy. Generations of shepherds have lived peacefully with the bears and wolves, knowing that some small portion of their herds may be lost to scavenging beasts but that the rest were well protected by the loyal Maremma. The result? Not just peace but pride. The Abruzzese tout their relationship with the land and animals as central to their character. They have reached a delicate balance, one whose foundation is respect for the power of the bears and wolves in the area even while they demand their own respect. The Maremma represents this desire for respect, even if it also represents the truce struck between man and beast. It represents human adaptation to nature, a willingness to accommodate, even if only to a certain degree. The dog embodies a long-standing peace, forged over generations and paid for by offerings of good will, and it represents long-standing pride in what is possible if humans work with animals and not against them. They represent balance, even if a tentative one, and their pervasiveness is a sign of health in the region. Yet today the Maremmas are declining in Abruzzo. And they are seen with increasing frequency wandering village alleys and valley byways instead of the mountainsides and high grazing lands. They tend to smaller flocks, fewer sheep, and come down from the mountains to lounge on street curbs and scavenge for food in trash bins. On any given night, a vagrant pup might play in Pescasseroli’s central square, chewing a crackling plastic bottle it plucked from roadside waste. They are restless, and they are signaling to anyone who will listen that the delicate balance between man and beast has been tipped in favor of man. They are telling us that the great peace has finally come to an end.